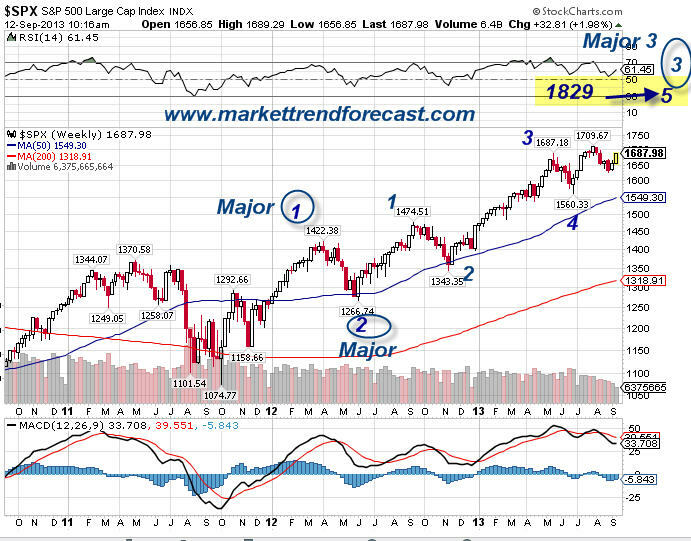 SP 500 Elliott Wave Forecast Unfolding As We Projected, What Is Next? Back on January 15th we wrote an article and also a elliott wave forecast for both the public and our subscribers showing a likely top at a maximum of 1868 on the SP 500. We said that Elliott Wave Major 3 of Primary Wave 3 would top no higher than that level. In fact, we can go back to September 4th 2013 and we projected a Major 3 high as 1822-1829. Turns out we were only about 1% off 4 months in advance of projecting that high, and once again we are on track here with Major 4 commencing from Major 3 highs. We simply use Fibonacci analysis of wave patterns which are based on human behavioural tendencies that go back centuries. Elliott Wave Theory is often hard to put into practice, so sometimes it gets a bad name. However, a bad steak at a restaurant doesn’t mean you never have steak again right? The practitioner must hone his or her skills over time and work to improve accuracy. Our view is pretty simple in that the Major wave 3 was 583 points going from 1267 to 1850, the double top. Now, assuming we are on track… once this Major 3 completes we will see a Major wave 5 of Primary wave 3 taking us to all-time highs. This will then complete Primary wave 3 of this 5 primary wave bull cycle and then larger Primary wave 4 corrections will ensue from those highs. We will know we are wrong in our degrees of wave counts if we pierce the 1628 level on the downside. That would indicate Primary 3 topped out 1850 and we are in Primary 4, which is not our current view.